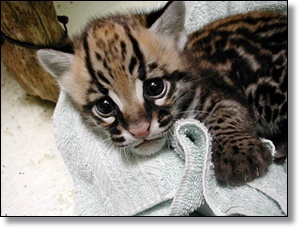 Salisbury, Maryland - There's a brand new ocelot kitten at the Salisbury Zoo. The zoo announced on Friday it recently received a year-old ocelot named Anahi from the Greenville Zoo in South Carolina. She was one of two female ocelot kittens born on Aug. 15, 2015. The kittens were the first offspring for parents Evita and Oz. The Greenville Zoo was one of two Association of Zoos and Aquariums (AZA) institutions to breed ocelots in 2015. The Salisbury Zoo lost its male ocelot, Ozzie, last winter. He was almost 17 years old, which the zoo says is old for an ocelot in captivity. Ozzie came to Salisbury from the Beardsley Zoo in Connecticut in 2009. The Salisbury Zoo is part of the ocelot Species Survival Program, which strives to ensure the sustainability of a healthy, genetically diverse and demographically varied population through breeding programs with the AZA-accredited institutions. Working with the AZA and the Ocelot Species Survival Program, the zoo hopes to obtain a male in the near future to pair with Anahi.